Never have I eaten so much amazing food as the week we tried the Deluxe Dining Plan at Walt Disney World. 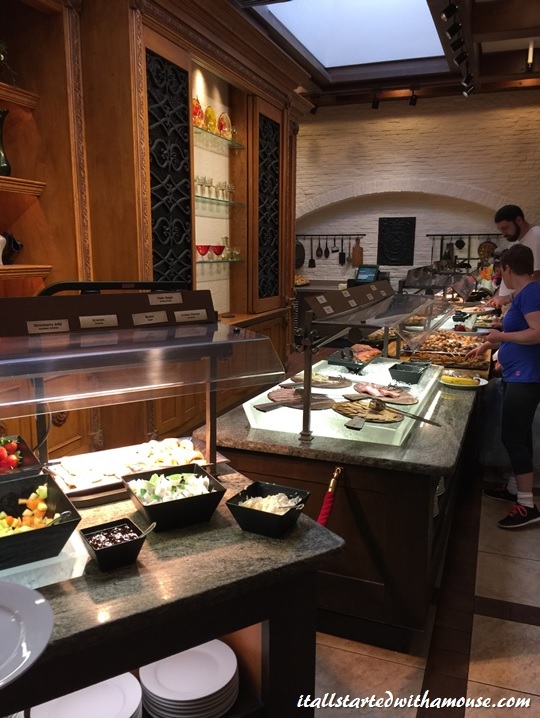 We have done the regular Disney Dining Plan before (1 quick service, and 1 table service credit per person per room night) and we both really liked it, but we decided we wanted to try lots of new things and the best way to accomplish this was with the Deluxe Dining Plan. The Deluxe Dining Plan includes 3 meal credits (quick service or table service) per person per room night, and 2 snack credits per person, per room night. The meal credits include 1 appetizer, 1 entrée, a non-alcoholic drink, and 1 dessert per person. 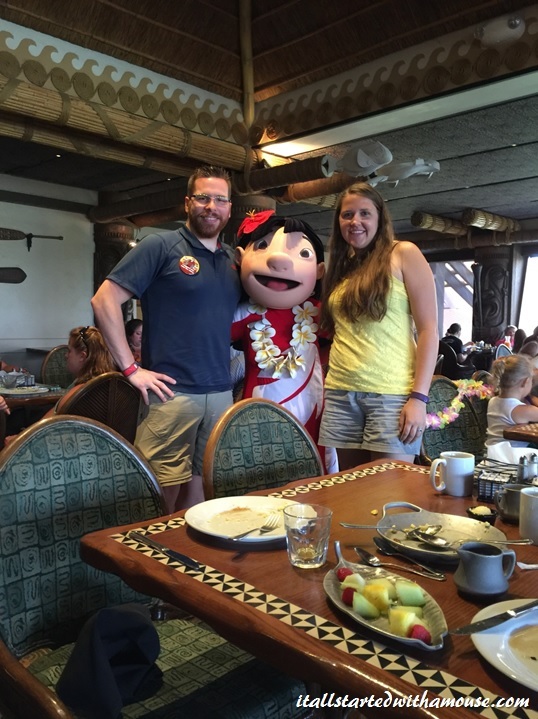 We had 5 nights booked at Disney’s Caribbean Beach Resort, so we had 15 meal credits and 10 snack credits!! 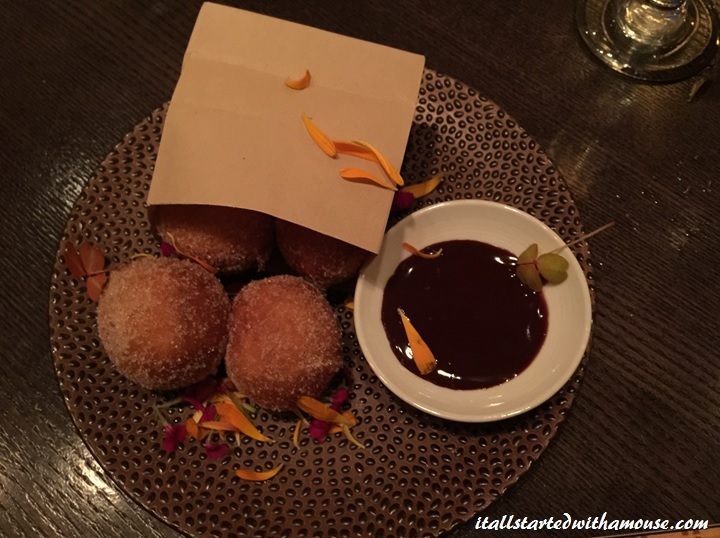 Why: To try new dining experiences! How: We drive down from Charlotte, NC, so we have our own car and that makes it much easier for park hopping, and trying different restaurants around property. We decided the best way for us to maximize our credits (and hopefully not gain 100 lbs) was to dine at a signature restaurant each evening, therefore using 2 credits at each experience, and to do a character breakfast each morning. We arrived at Animal Kingdom in the morning and had planned to use a snack credit for lunch. 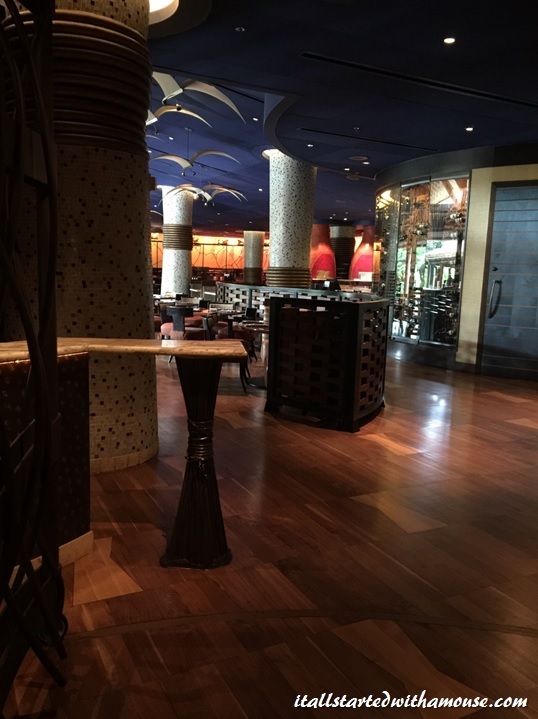 We quickly learned that you cannot use any of the dining credits before you have checked into your resort. Oops. We still got what we had planned on getting for lunch, but instead of us each getting our own, we split a Baked Three-Cheese Pasta from Eight Spoon Cafe in Discovery Island. We had afternoon FastPass+ reservations at Kilimanjaro Safaris, Expedition Everest, and DINOSAUR. After DINOSAUR, it was check-in time at Caribbean Beach, so we left Animal Kingdom for the day and took a break at Caribbean Beach before dinner. We had a 6:00pm dinner reservation at Le Cellier Steakhouse in the Canada Pavilion at Epcot. So around 5, we drove over to Epcot. Le Cellier was amazing. We both had the Canadian Cheddar Cheese Soup as our appetizer, I had the Filet Mignon as my entrée, Ryan had the Black Angus Boneless Rib-Eye. For dessert, Ryan tried the Maple Crème Brûlée and I got a piece of cheesecake to go (I was not yet prepared for the amount of food that I would be consuming this week!). We both really loved Le Cellier. The atmosphere was great, and our service was wonderful. We both still talk about the Cheddar Cheese Soup, and would highly recommend the restaurant. This morning we had our first breakfast reservation and our first character experience. We had a 9:35am reservation at Akershus Royal Banquet Hall at the Norway Pavilion in Epcot. We had afternoon FastPass+ reservations at Test Track, Meet Disney Pals at Epcot Character Spot, and Spaceship Earth. That evening we had dinner reservations at Artist Point at Disney’s Wilderness Lodge. I wasn’t really sure what to expect with this. At first I was a little uncomfortable because we seemed to be the only people without a little girl with us. However, all the cast members were very friendly and all the princesses were very happy to meet us! The buffet food was not for me, but my husband grabbed some interesting food from there that he enjoyed. We both liked the fruit platter, and the hot food platter that we got (can’t go wrong with Mickey Waffles!). Overall, we both enjoyed Akershus, and out of the 2 princess meals we had this trip, Akershus is the one we would revisit. Plus the value of the meal on the dining plan is fantastic, so it is something I would recommend for travelers on any of the dining plans. We both love Wilderness Lodge, so we got there a little early and walked around the Lodge for a bit before our 7:15pm dinner reservation. We were seated in a booth looking out the giant windows towards the pool and Bay Lake. The restaurant is quite rustic but quiet, and our server was amazing! I told her that I was trying to convince my husband to move down to Florida, and she kept coming over with reasons for him to want to move to Florida. It was a lot of fun! 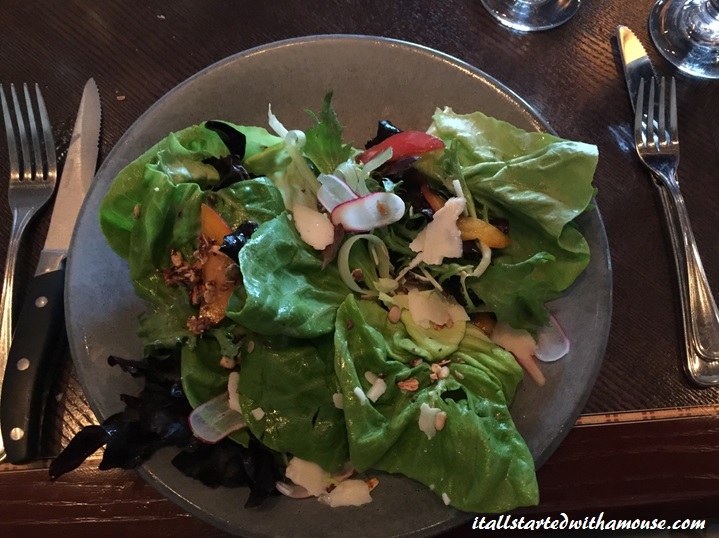 For our appetizers, we both tried the Land Greens Salad – it’s made from vegetables grown in The Land pavilion at Epcot and since Living with the Land is one of my favorite things to do at Epcot, we both had to try it. For our entrées, I tried the Aged Buffalo Strip Loin – it was incredible, and Ryan got the Grilled Filet Mignon. For dessert, I got the Warm House-Made Donuts (which I could use on a chilly October day like today) and Ryan had the Artist Point Cobbler. Overall, we both really enjoyed our meals, the atmosphere was great and our service was awesome, however I do not believe it was a good value for us on the Deluxe Dining Plan. This was our first Magic Kingdom day. I wanted to get an early morning ADR so we could get great pictures on Main Street without the crowds – which we did! This is something I cannot recommend enough, especially if you don’t mind being up early. Make an early ADR at Cinderella’s Royal Table, The Crystal Palace or Be Our Guest before park open and you can get some amazing pictures inside Magic Kingdom. 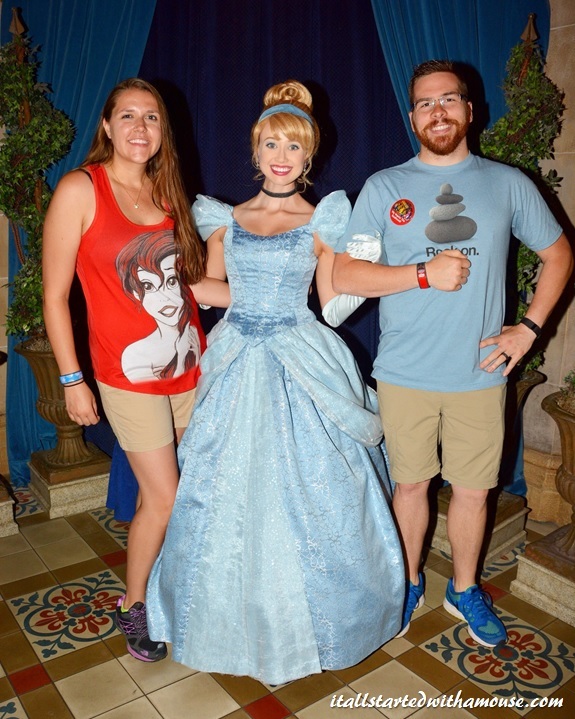 There are PhotoPass photographers out that early so you can take full advantage of that. Just be sure to check park hours and Extra Magic Hours and make sure that your 8:00am ADR isn’t on a day with Magic Kingdom morning Extra Magic Hours. Our first reservation of the day was at Cinderella’s Royal Table at 8:35am. We had afternoon FastPass+ reservations at Seven Dwarfs Mine Train, Splash Mountain, and Big Thunder Mountain Railroad. Our dinner for this evening was at Narcoossee’s at 6:15pm. We were first greeted by none other than Cinderella herself before we headed upstairs for breakfast. We were seated on an upper level, right by the entrance to the restaurant. My first impressions were that it was a beautiful restaurant, the ceiling is lovely and the stained glass windows are incredible, but it was pretty noisy. You are brought juice and a pastry platter and then you get to order off a small menu. Ryan and I both went with the Traditional Breakfast. I enjoyed meeting all the princess (my husband was the photographer), and getting a chance to dine inside the castle. However, it was pretty noisy, the food was just okay, and our service was also just okay. I would probably not go back to Cinderella’s Royal Table, but I can understand its appeal. I also don’t believe it is worth the money, dining plan or no dining plan. Plus, we ended up spending more on the dining credit than our meal would have cost out of pocket. I had always wanted to eat in the castle and see what the fuss was about and after having done that, I can say that we will not be doing it again, but I am glad we experienced it. We took the boat over to the Grand Floridian from Magic Kingdom when it was time for our 6:15pm dinner reservation. I am not a huge fan of seafood, which Narcoossee’s specializes in, but my husband is and I picked Narcoossee’s especially for him. We had a table that had a great view of Magic Kingdom and Seven Seas Lagoon, and had it been later, it would have been an amazing spot to watch Wishes from. For our appetizers, I decided to try the Artisanal Cheese platter and my husband got the Crispy Rhode Island Calamari. We both enjoyed sampling all the different cheeses and accompaniments, and I realized that I much prefer hard cheeses to soft cheeses. For our main course, my husband got the Two-Pound Steamed Maine Lobster and I had the Grilled Filet Mignon. This was my husband’s first experience with eating a whole lobster and he really enjoyed it. For dessert, I tried the Narcoossee’s Candy Bar and Ryan got the Almond Crusted Cheesecake. Overall, we both really enjoyed our experience. It was a relaxing, quiet dinner. We didn’t feel rushed at all and we got to enjoy our view and our meal. It was very expensive, and when we got the bill, we were both very glad to be on the Deluxe Dining Plan! If I could do it over, I would have scheduled a later ADR and enjoyed Wishes from the comfort of our table! We love the Contemporary Resort. We stayed here and really loved it, and we almost always visit this resort in some capacity on our vacations, usually it’s to eat. This trip was no different and we had an 8:30am ADR at Chef Mickey’s. I had heard not so great reviews regarding the food, so I went in with extremely low expectations, however I was pleasantly surprised and this ended up being our favorite breakfast and favorite character meal of the whole trip. 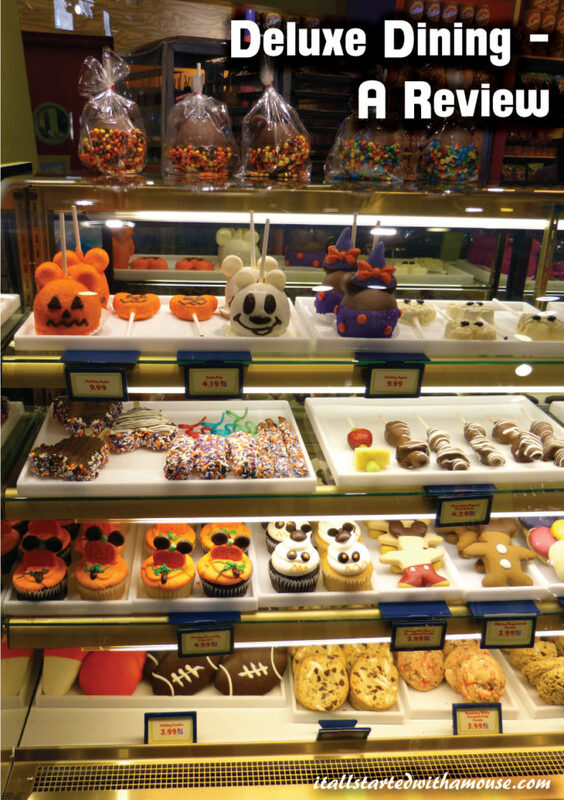 Chef Mickey’s is a true buffet style meal and they have everything you could possibly imagine. I don’t eat a whole lot at breakfast, so I am perfectly happy with fruit and some Mickey waffles! Even though it was an extremely loud atmosphere, it was really fun. The character interactions were great and they even made my husband get in some of the photos! It was so much fun and we both left feeling really happy and excited for the rest of our day. Hands down, this was my favorite way to start the day, and I cannot highly recommend Chef Mickey’s enough. No wonder it’s such a hard ADR to snag!! Me and the mouse himself, Mickey! 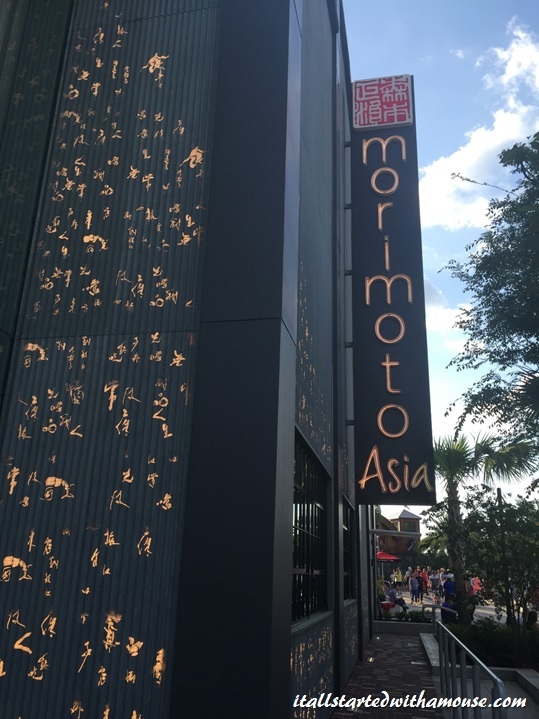 This evening we had a 6:45pm reservation at Morimoto Asia, so we headed over to Disney Springs a little early to take a look around at all the new stuff over there (Town Center was opening in 2 days time, on May 15th, so we wanted to poke around and see as much as we could). When we were seated, it was on the second level, looking out over the restaurant. It is a truly spectacular place. The giant chandeliers are absolutely incredible, and the whole place is gorgeous. We also stepped out onto the balcony and there is a great view of Disney Springs and Town Center from that vantage. For our appetizers, I got the Chicken Dumplings and Ryan tried the Hamaci Tacos. I thought the dumplings were excellent and my husband enjoyed his tacos. For the entrées, I got the Morimoto Chicken Fried Rice and Ryan tried the Orange Chicken. To finish out the meal, I had the Churro Fondue for dessert and my husband had the Chef’s Choice Sorbet Trio. The churro was actually one of my favorite desserts of the whole trip! All-in-all, we enjoyed our experience at Morimoto Asia, the food was great, the restaurant is beautiful and our service was wonderful. That being said, I would NOT recommend this as a spot to try with your dining plan. The menu is fairly priced and nothing is expensive enough to merit it being worth 2 dining credits. We skipped Saturday! Actually, I have family that lives outside of Orlando, so we used some snack credits at Old Port Royale for lunch this day and then spent the evening with them on Saturday. 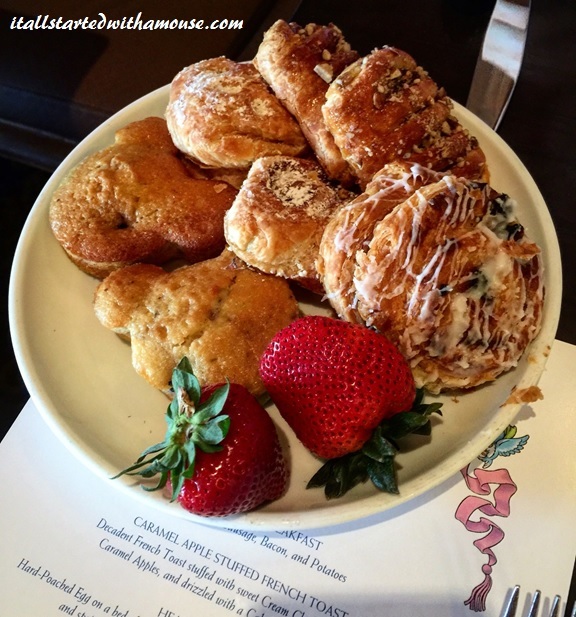 On Sunday morning, we packed up our stuff in the car since it was check-out day (I added an extra day at the end in Royal Rooms at Disney’s Port Orleans Riverside) and we headed over to the Polynesian Village Resort for our breakfast at ‘Ohana. We spent this day at Hollywood Studios and Animal Kingdom, with FastPass+ at Rock ‘n Roller Coaster and Tower of Terror. 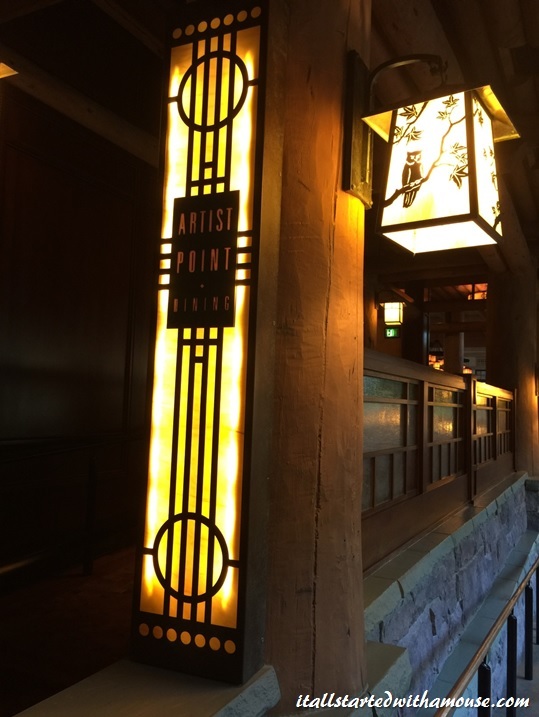 We finished out the Deluxe Dining Extravaganza at Jiko – The Cooking Place at Animal Kingdom Lodge. I was so looking forward to eating at ‘Ohana. 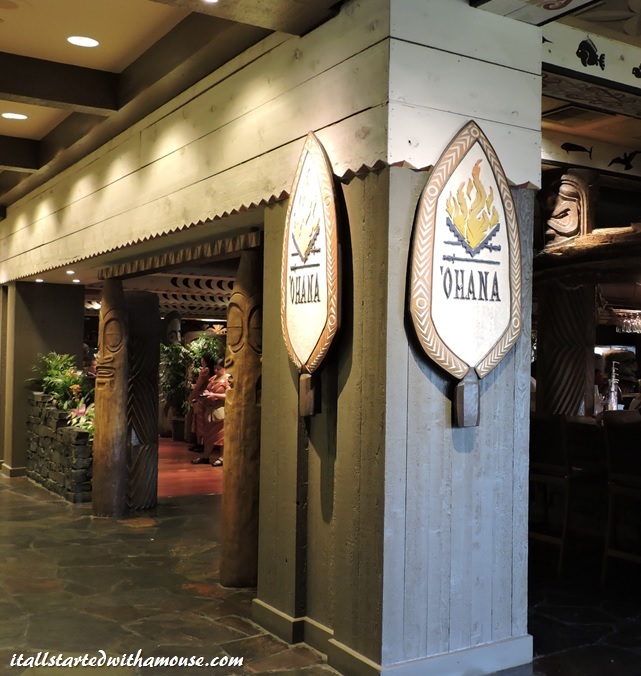 I had heard nothing but great things about it and I love the Polynesian, so any excuse to get over there, we will take. Since we were checking out this morning, I made a later ADR, at 9:40am. We arrived at the Polynesian and had to wait a little bit to be seated. Once we got in, we discovered a fairly loud and busy restaurant. I hate to complain, but this was one of our worst dining experiences at Disney ever. Our server was not even remotely friendly, and they were turning tables so quickly, that Pluto never even stopped in our section. The food was fine, and is served family style. We will definitely not be returning to ‘Ohana and this is extra disappointing to me because Lilo and Stitch is one of my all-time favorite Disney movies. After a disappointing breakfast, and spending our day at Hollywood Studios, and then checking into the coolest hotel room at Disney World, (seriously – check out these rooms) we were ready to head over to Animal Kingdom Lodge for dinner. Animal Kingdom Lodge is another one of our favorite resorts at Disney. Boma is my husband’s favorite restaurant and this was our first trip where we didn’t eat there, so to make up for it, we decided to try Jiko. The restaurant is really gorgeous. The back wall in the restaurant mimics the setting sun, so as you dine, the lighting colors subtly change. Our service here was wonderful and the cast members are so happy to talk to you about where they are from. This is one of our favorite things about visiting Animal Kingdom Lodge. The cast members here are incredible. For our appetizers, I tried the Taste of Africa and Ryan got the Grilled Wild Boar Tenderloin. The Taste of Africa included Naan bread with different dips (similar, but smaller than, the bread service at Sanaa). The Grilled Wild Boar was also very tasty, and had a little bit of African spice, to give it a kick. For our entrées, I had the Oak-Grilled Filet Mignon (I know what I like!) and Ryan had the Chermoula-Rubbed Colorado Lamb Chop. We finished out our final meal on the Deluxe Dining Plan with dessert. Ryan got the Pistachio and Cherry Trifle and I had the Valrhona Chocolate Mousse and Hazelnut Dacquoise Cake. This was probably our most adventurous meal, and we both really enjoyed it. The cost of the meal, and the cost of the dining plan credits were pretty equal, so it averaged out here. Ryan loves Starbucks, so everyday he got at least 1 drink at Starbucks as a Snack Credit. This is an excellent use of the snack credits, as a lot of these drinks are around $5. We also used a lot of snack credits at the Outdoor Kitchens at the Flower and Garden Festival in Epcot. All said and done, we had 20 snack credits, worth between $3 – $5 a piece, and we spent $122.91 in snacks. At $3 each that would be $60, and at $5 each that would be $100, so we made out quite well with our snack credit usage. With using the plan, even though some of our meals were not quite worth the cost of the credits, we still ended up doing pretty well with our use of the dining plan credits. However, we do not usually eat appetizers and desserts when we go out, and if we do get an appetizer, we usually get one thing and split it between us. Therefore, we ended up spending more than we normally would in that sense. I am really glad that we did the Deluxe Dining Plan, and I would probably do it again someday, but probably not anytime soon. There is a lot of work that goes into planning a Deluxe Dining vacation, and you need to be sure that you are going to get the most out of the plan before you use it, otherwise you could end up spending way more money. Our favorite thing about the dining plan though is that since its already paid for, you don’t have to worry about the cost of the items on the menu, and you get to enjoy the experiences a little more. Bottom line: We loved trying new things and new experiences and we will most likely do it again in the future; unless Disney continues their trend of significant price increases. Great post! I love how you broke out the actual cost vs. the dining plan credit cost. Great idea! Awesome pics too.